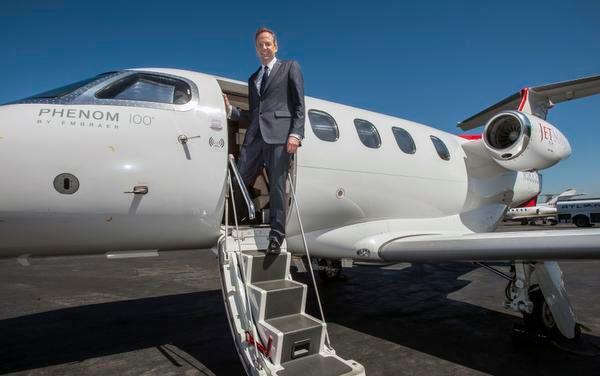 Alex Wilcox, the chief executive officer and founder of JetSuite, stands in the doorway of the company’s Phenom 100 jet at John Wayne Airport. Photo credit Mark Rightmire, OC Register. JetSuite, Inc. announced today at NBAA’s Business Conference & Exhibition that it has expanded its fleet with the first two of several Embraer Phenom 300s. The company took delivery of its first Phenom 300s in late September and early October, and expects to begin flying this popular light jet as part of its charter service later in October. JetSuite’s 20-aircraft fleet of Wi-Fi equipped light jets are included in the Floating Fleets section of FlightList PRO‘s multi-search platform along with all 335 floating fleet aircraft and 25 operators. Free 30-day trials are now available here. The Phenom 300 has been the world’s best-selling business jet for the last four years running. It features enhanced cabin space, speed and range, as compared to JetSuite’s current light jet fleet of Phenom 100s and Citation Jet 3s. The aircraft will debut as part of the company’s SuiteKey Membership program flights, for those traveling with parties of up to seven, and will initially be priced and offered interchangeably with the CJ3s. The debut of the P300 in the JetSuite fleet comes soon after the company announcing its Aircraft Management program, to help answer demand for its charter flights and growth in the SuiteKey membership program. This management offering features several options that can offer aircraft owners reductions in the operating cost their planes. All 20 JetSuite charter light jets are available in the FlightList PRO multi-search platform which includes all 16,631 charter aircraft and 3,419 charter operators worldwide. FlightList PRO is used by the most successful and experienced brokers and travel professionals in the industry; 80% of users have arranged charters more than 10 years, 25% more than 20 years. This entry was posted in Operator Updates, Private Aviation Industry News and tagged Air Charter News, Embraer Phenom, Floating Fleet, Jet Charter Operator on October 11, 2017 by FlightList PRO.